Emmy Noether was a force in mathematics — and knew it. She was fully confident in her capabilities and ideas. Yet a century on, those ideas, and their contribution to science, often go unnoticed. Most physicists are aware of her fundamental theorem, which puts symmetry at the heart of physical law. But how many know anything of her and her life? A conference in London this week, the Noether Celebration, hopes to change that. It’s a welcome move. In a world where young scientists look for inspirational female role models, it is hard to think of a more deserving candidate. Noether was born in 1882 in Erlangen, Germany. Her parents wanted all their children to get doctorates, so although many universities at the time did not formally accept women, she went. 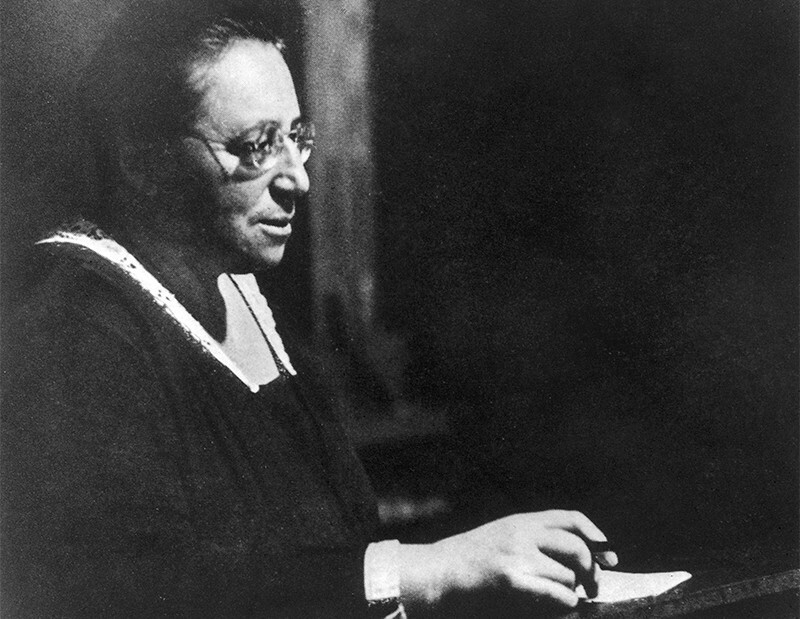 After graduation, sexist regulations prevented Noether from getting jobs in academia. Undaunted, for many years she lectured in Erlangen and, from 1915, at the University of Göttingen — often for free. At the time, that city was the centre of the mathematical world, largely due to the presence of two of its titans — Felix Klein and David Hilbert. But even when Noether was being paid to teach at Göttingen and making her most important contributions, fate and further discrimination intervened: Hitler took power in 1933 and she was fired for being Jewish. She escaped to the United States and taught at Bryn Mawr College in Pennsylvania, until she died in 1935, at the age of just 53. Noether saw maths as what are now called structures. To her, the characteristics of a structure’s components — be they numbers, polynomials or something else — mattered less than the networks of relations among an entire set of objects. This enabled her to give proofs that applied to more general structures than the original ones, and which revealed unseen connections. It was a new and elegant approach that changed the face of algebra. And Noether realized that it could influence other parts of maths. One was topology, a field in which “she published half a sentence and has an everlasting effect”, one mathematician wrote. Before Noether, topologists had been counting holes in doughnuts; she brought to bear the full power of her structures to create something called algebraic topology. The results that Noether published 100 years ago were, for her, a rare foray into physics, in which she was not particularly interested. Albert Einstein had just developed his general theory of relativity, and was struggling to understand how energy fitted into his equations. Hilbert and Klein were working on it, too, and asked Noether for help. That she did help is an understatement. Noether’s expertise in symmetry led her to discover that the symmetries of a physical system are inextricably linked to physical quantities that are conserved, such as energy. These ideas became known as Noether’s theorem (E. Noether Nachr. d. Ges. d. Wiss. zu Göttingen, Math.-phys. Kl. 1918, 235–257; 1918). As well as answering a conundrum in general relativity, this theorem became a guiding principle for the discovery of new physical laws. For example, researchers soon realized that the conservation of net electric charge — which can neither be created nor destroyed — is intimately related to the rotational symmetry of a plane around a point. The impact was profound: those who created the standard model of particle physics, and the researchers who attempt to extend it, think in terms of Noether’s symmetries. Some biographies inaccurately portray Noether as a somewhat helpless genius at the mercy of men’s charitable actions. In reality, she was an assertive personality, recognized leader and the first female plenary speaker at the renowned International Congress of Mathematicians. The status of women in mathematics and science has improved since Noether’s time, but bias and discrimination remain. Too few leading female mathematicians receive the recognition they deserve. (Only one woman, Maryam Mirzakhani, has received the Fields Medal, and none has won the Abel Prize — the field’s top awards.) Noether is an inspiration: including to UK mathematician Elizabeth Mansfield, who co-organized the London meeting and works on modern extensions of Noether’s work. We don’t know how many potential Emmy Noethers have been unfairly denied the chance to show their talents. More people should know — and should celebrate — one who changed the scientific world against the odds.